SMITHFIELD, R.I. - There’s something about playing Northeast Conference opponents that brings out the best in the Central Connecticut State football team. 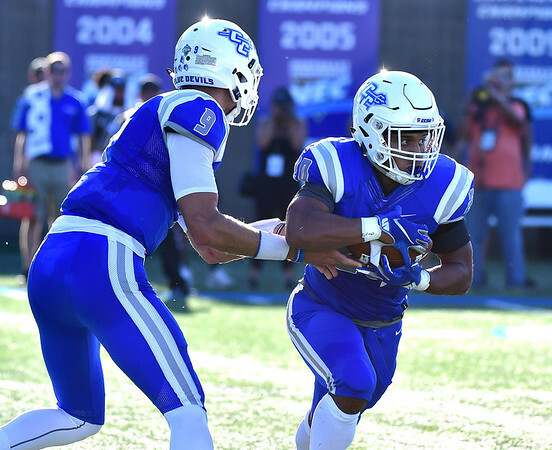 The Blue Devils scored 48 unanswered points to overcome an early two-touchdown deficit to cruise to a 48-14 victory over Bryant Saturday afternoon and win their eighth straight NEC game. Quarterback Jacob Dolegala threw for 225 yards and a touchdown on 14-of-20 passing. He started 2-of-7 with an interception and finished the game completing 12 of his final 13 passes. Dolegala also make plays with his legs, rushing for 78 yards and three scored. Junior running back Drew Jean-Guillaume highlighted the Blue Devils’ ground game with a career-high 203 yards and a touchdown on 23 attempts. Overall, CCSU (4-3, 2-0 NEC) ran for 442 yards on the afternoon - Aaron Dawson ran for 99 and a score, while Danley Exilhomme rushed for 60 and a touchdown - and collected 667 yards of total offense. The Blue Devils put up 56 points and 669 yards of total offense last week in a win over Robert Morris. As the offense did what it wanted, CCSU’s defense played just as well. The unit allowed just seven points - the Bulldogs (4-2, 2-1) scored a touchdown on a 98-yard interception return from Eulogio Portugal - and surrendered only 292 yards of total offense, while forcing two turnovers. Down 14-6 to start the second quarter, Dolegala hit Courtney Rush for a season-long 61-yard touchdown pass to cut Bryant’s lead to one midway through the period. The Blue Devils took their first lead with 1:51 left on the first-half clock after Dawson’s 7-yard run capped off a 10-play, 71-yard drive. Rush finished with 146 yards on just five catches. The Bulldogs attempted to answer and drove to the CCSU 1-yard line, but safety Tymir Hinton sacked quarterback Price Wilson, causing a fumble, allowing Michon Hunt to recover the ball. Wilson, who came into the game with a conference-leading 1,445 yards and 15 touchdowns, completed 14-of-34 passes for 168 yards. From that point on, the game belonged to the Blue Devils. CCSU put up 28 points in the second half, including 20 in the fourth quarter. Dolegala ran from eight yards out in the third quarter to make the score 28-14 after Jose Garcia’s two-point conversion. Jean-Guillaume’s 21-yard run at the start of the fourth pushed the Blue Devils’ lead to 20. An 18-yard run by Dolegala and 48-yard run by Exilhomme capped off CCSU’s scoring. The Blue Devils will now return home for the first time in five weeks next Saturday when they host Sacred Heart at 1 p.m.
Posted in Newington Town Crier, CCSU on Saturday, 13 October 2018 18:09. Updated: Saturday, 13 October 2018 18:24.